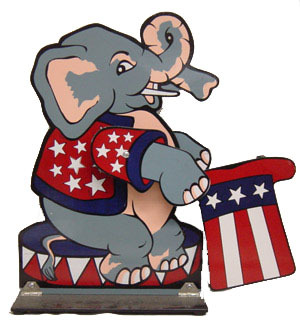 The “daddy” of animated card props, this is a cut-out of Jumbo, the famous African elephant of P.T. Barnum’s “Greatest Show on Earth”. And obviously, like all elephants, he uses jumbo cards for his card games ! Have one or more cards freely selected from a “Jumbo deck”. Mix them back into the deck, and drop them into Jumbo’s top hat. Then Jumbo comes to life. He tips his hat, and with his trunk picks out the selected cards, one at a time. You can have Jumbo do a bit of maths, or find a picture from a stack of picture cards, and NO, there are no forces, and the cards could be signed, and YES, you can have Jumbo pick out as many cards as you wish. Magician Clown Gay Ljungberg of Sweden was one of the first to see a set, and said, “An extremely beautiful prop . The mechanics work like a Volvo automobile. Good that you took the trouble and expenses to add the gag cards, it makes the prop worth so much more for the customer. Good theming, nice artwork, quality mechanics, workable routines. It is a very good buy for any children’s entertainer or comedy magician.” I couldn’t have described it better, and I would “modestly” agree with him, since it took me over a year to translate the original concept through several incarnations into the perfect practical prop I offer you.